Every year, we do a wedding that's a little out of our comfort zone. 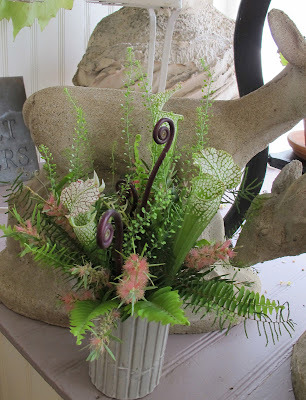 Cynthia, one of our favorite customers came to us to do her son's flowers for his upcoming wedding. Cynthia's son was the interpreter of what his fiancee might or might not want. He's an editor for a magazine about cheese. The two of them lived on the West Coast, so wouldn't be in town for the first meeting with me. Cynthia set the stage for the flowers via her son: the bride is a Botanist, she does a lot of trekking through Central America and Asia for her research; her favorite flower is a bromiliade. Cynthia loves garden roses and peonies. O Dear. The reception was going to be at The Journeyman, a small restaurant serving up powerful flavors and beautiful presentations in Union Square. The decor is bare bones. A huge window with shelves of wood wine boxes filled with plants and herbs serves as a window treatment. The kitchen is open, the tables are small and the chairs are black and chrome. A bit of whimsey is created by small chair slips covering their backs in a lovely robin's egg blue. The bride's gown was found at Poor Little Rich Girl. She was hiking in the Himalayas two weeks before the wedding. This was a laid-back bride. Will stopped in a few times to chat when he was in town. He has his mother's charm. Sadly, we never met his fiancee. So, basically, we had carte blanche with the flowers. But, how to charm the bride and please dear Cynthia. We don't do much with tropicals. Truthfully, I don't love most orchids, and Haliconia and Ginger leave me cold. 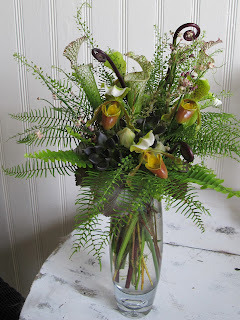 But I do love ferns, and Lady Slippers, and Saracena Lilies. We were so busy on Saturday, I didn't have time to photograph the personal flowers or the two large pieces. Too bad: I'd bought my first and probably last stem of bananas. I did take pics of the bride's bouquet before the ribbon went on. Weddings and graduations coming up this week. It's going to be a Ball jar jamboree with peonies and local early summer flowers. Next week, I'm taking Tuesday off to visit lots of donkeys! I think you rose to the occasion. They're beautiful and totally unique. Stunning actually. I would trust that the new Mrs. was thrilled. What are the pink flowers in the first photo? What a great story! No pressure, right? 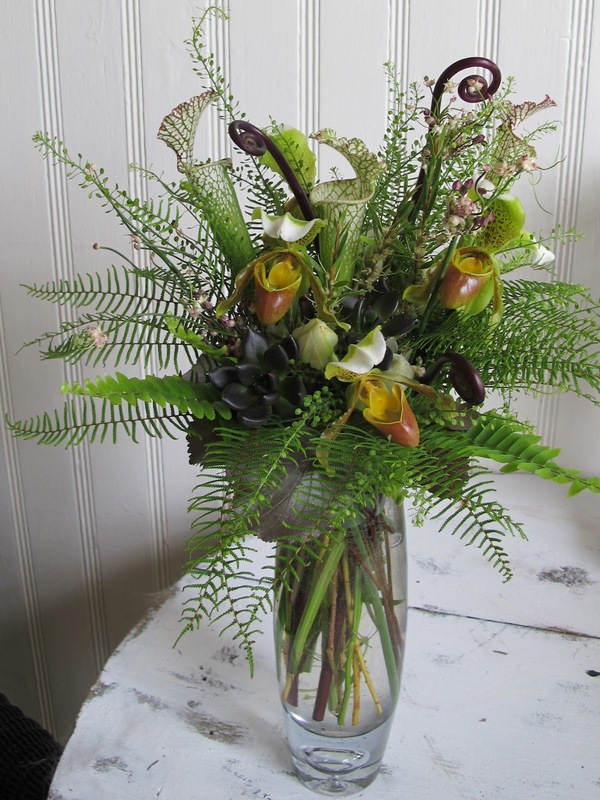 The flowers are fabulous--I feel the same way you do about orchids and tropicals, but I love these--they are wild and warm and interesting and eclectic. The lacy ferns really pull it all together. you are brilliant and the flowers are lovely ! Quite stunning! How wonderful to be pushed out of your comfort zone and succeeding so brilliantly! They are perfect. Amazing you managed to blend global and feminine so perfectly. Love the ferns. What did you use for ribbon? Seems to me you really got it. They're beautiful and unique, love the ferns. I'm sure she did too.